Credit’s still a-crunching in bank-land, although for once it’s just possible that I find myself in a relatively secure part. But I’ve felt secure in the face of crisis before: wrongly as it transpired, so we’ll see. I can’t say I was ever much of a fan of the rather clunky way in which we used VBA to add and extend menus, toolbars and (in particular) categorise user functions (who’d have thought we’d still be calling Excel 4 macros in the 21st century?). But xlUnit needs to expose its (minimal) UI into Excel 2007 in an appropriate fashion, so I need to bite the bullet and figure out how to tie me a ribbon. in Office Fluent UI. Gulp. Let’s start with Adding Custom Buttons to the 2007 Office Fluent User Interface. Ooh, a video. Doesn’t work. And the XML is nonsense. And to be honest, for the first time in well over a decade I don’t actually have a Microsoft development environment loaded on my laptop – and I don’t seem to be missing it. There must be an easier way. Back to Google. Now this is more like it. Run a little utility to insert the XML – and the example code is valid this time – and hook up to a VBA routine. Not only that, but it explains how the process works so that you can work without the utility completely. A typical unit testing framework provides a means to identify tests, execute them and report on their successful completion – or otherwise. Remember that a failing test isn’t a bad thing, it’s an invitation to extend one’s code. Ideally the framework should take care of everything that isn’t about writing new tests. Methods vary across frameworks, but it seems to be true (from the limited sample I’ve actually looked at) that where reflection is available, then either by convention or attribution, tests can be identified at run time. For example, nUnit tests are denoted by having the “Test” attribute assigned to them, while Ruby’s test/unit looks for methods whose names start with “test” at execution time. While this may not seem such a big improvement over manually adding calls to your test routines, anything that lowers the amount of unnecessary effort on the part of the user is worthwhile, especially when the idea is that you write a lot of tests. VBA doesn’t exactly have that much reflective capability, although we do have the ability to scan code modules, which could pretty much amount to the same thing. Not only that, but we can write code on a “just-in-time” basis, which is really handy. Very dynamic. In xlUnit I have a TestFinder class whose job is to examine the modules in the test application to find all the classes that implement the “TestCase” interface. Then I build a new disposable test module that, when executed, builds a Collection of TestCase objects, one per class identified. Finally, a TestRunner object executes the “Run” method of each object. I’ve chosen, for the moment, to ignore the common “Fixture”, an aggregation of cases, mostly because it’s not obvious how to implement it in a frictionless way. Setup() and Teardown() are pre- and post-execution routines – for creation of the conditions necessary for the execution of the tests within the class and tidying up afterwards. I’m not completely happy with the way this is done at present: it’s less flexible and hence less useful than in some (at least) of the other frameworks. And when I manage to persuade CodePlex to let me upload something via TortoiseSVN I’ll start to document the weak areas as issues. I hope when I say “when”, I don’t really mean “if”. I need to say something about the “plumbing” aspects, which I’m both rather proud of and which, perhaps paradoxically, are also in need of a fair amount of work. I’ll try to get to those shortly, by which time (assuming “when” not “if”) there should be something to look at. OK, so there’s a codeplex project set up with no content as yet, and a 30-day deadline to get something in and published. Nothing like a bit of pressure to turn a chap’s thoughts to prevaricating. 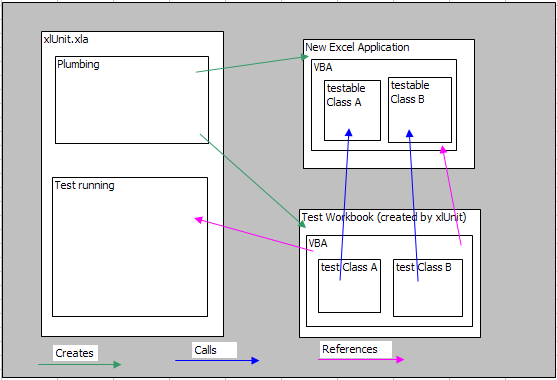 Why a “unit testing framework” for Excel VBA? Let me see if I can put together a potted history. Some years ago I became infected with the Agile development virus. Some of the practises they described reflected things I’d figured out for myself over the years, some made immediate sense in a “why didn’t I think of that?” way and some I’m still struggling to really get to grips with. The idea of TDD can be summarised in three words: red-green-refactor. Here, briefly is my understanding of how it works. First write a test that is intended to expose some behaviour that you expect your software to exhibit. Then you run your test. It should fail. That’s the “red” part, and many frameworks display something red to give you a visual clue and astimulus to rectify the failure. Now that you’re “red”, you can write some code to implement the missing behaviour. The trick is to only do just enough to make the test pass. You should be able, in most cases to do so in a few minutes. (I’m very bad at this) Then you run your test again. All your tests, ideally. The test should pass and you should get a rewarding flash of greenness to signify that everything your tests specify is being delivered. Sometimes changing or adding code breaks something elsewhere – with the tests, you know instantly. I’m a huge fan of this. As you add code to pass your tests, you should discover opportunities to improve the design, to “refactor”. Removal of duplication, improved coherence and reduced coupling can all be sought, all the while making small changes while still able to check that the code has not changed functionally because you can run the tests. This is the big win. You don’t need a framework. You can just start writing code that runs code and checks the results. Refactoring to remove duplication and improve design will tend to separate testing code from functional code, however, and after a while extracting that reusable code into a separate package becomes obvious. 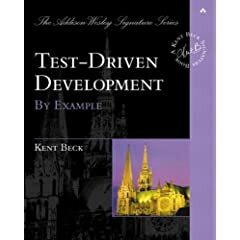 The second half of the Kent Beck TDD book (probably the canonical work on the subject) shows the “bootstrapping” development of a unit testing framework in Python, using it to test itself. Inspiring, to people with minds that work that way…. But none of that was any good to me, sitting as I was in a job that mostly involved building large complex lumps of VBA within Excel – I didn’t have a testing framework. I searched, and to get up-to-date, I just searched again. A list of unit testing frameworks here, and another one here are both singularly reticent on the subject of VBA or any flavour, let alone the Excel one. Why would that be? Are Excel/VBA developers not really programmers? I certainly felt like a programmer. And I’ve used nUnit with C# and VB.Net and the test/unit and (charming) rspec libraries with Ruby. So I built one. As I prepare what currently exists for publication, which will have to include at least some identification of all the ways it’s slightly broken in Excel 2007 (sigh), I’ll go through how I implemented the thing, so that when the real brains see it they’ll be able to show me where I went wrong. Or could have gone righter.